An early determinate variety having good presentation. Fruit Shape is Round. Color is deep red, globe type. Weight approx 70 -75 gms. Maturity in 108- 112 days. It has uniform shoulders and is used for dual purpose. An determinate variety. Fruit Shape is squarish round. Weight approx 70 -80 gms. Maturity in 115- 120 days. It has uniform shoulder. It is used for dual purpose and long transportation. 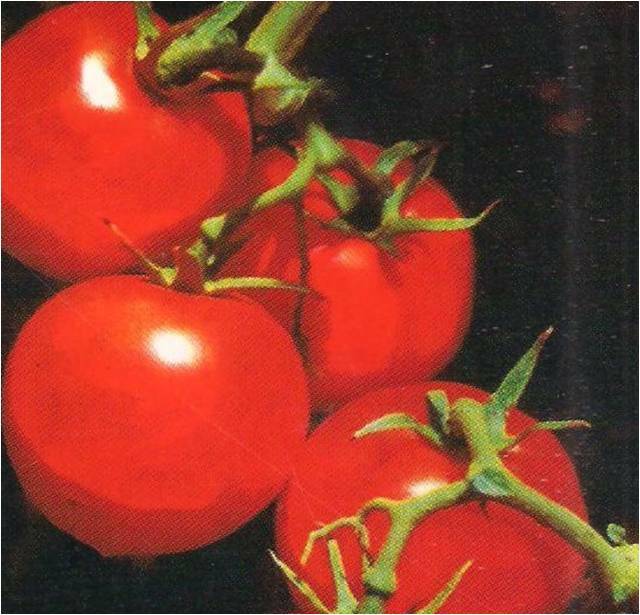 It is a determinate hybrid variety fruit with dark red color and oveal round in shape, weighing around 85 to 95 gms. Very profile bearing having better taste & bearing good keeping quality. Yield 28 to 32 M.T.per acre. The main and the most attractive feature of this variety is Fusarium wilt resistant & fruits are excellent for longer distance transportation. 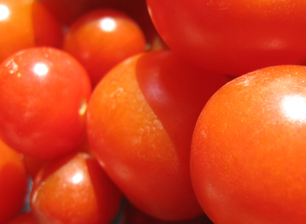 An outstanding determinate tomato hybrid. Fruits weigh 70-80 gm. 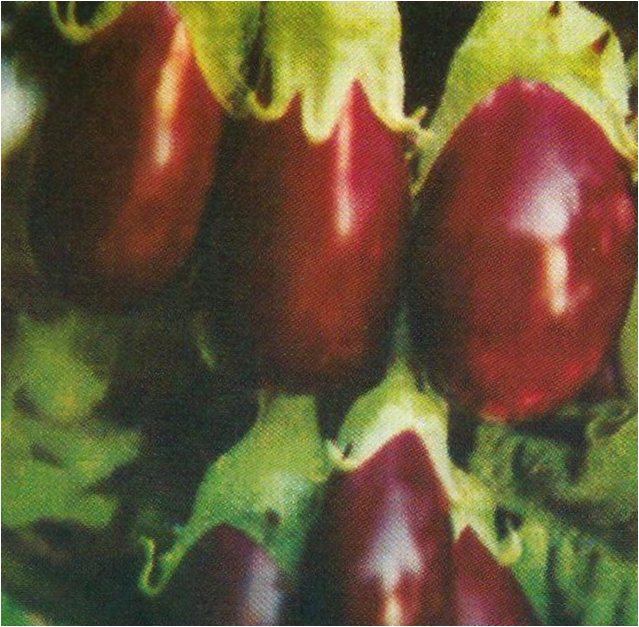 Prolific bearer, having dark red round fruit. Needs lesser sprays of fungicides. Excellent for long distance transportation. Average yield is 35 tons & above per acre. It is early variety. 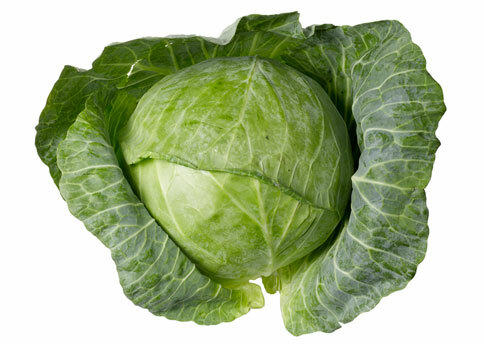 Matures 12-13 days earlier than any other hybrid variety. 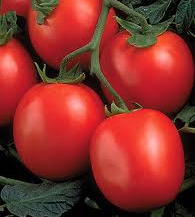 Taste of the fruit is very much liked by the farmers and very good for Salad purpose. It is a determinate variety. 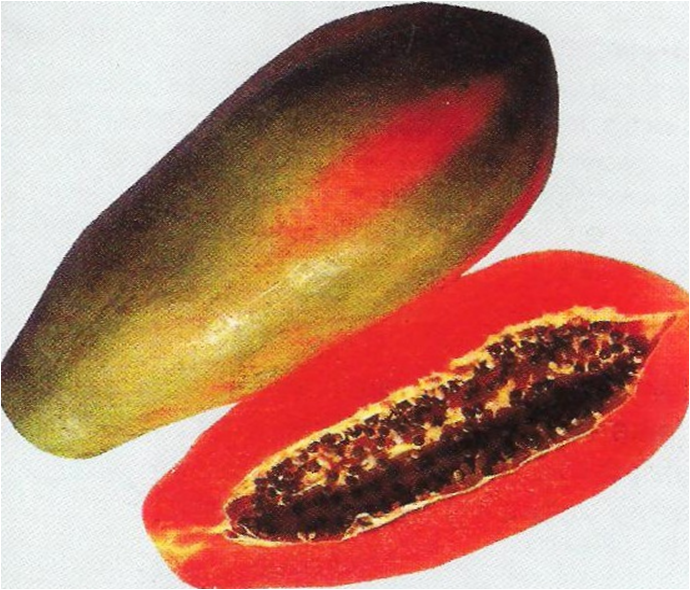 Its fruits are dark red. Flatish round in shape. Weighing around 80 gms to 85 gms. Very profile bearing having better taste and bearing good keeping quality. Yeild 42-45 M.T. per acre. Its keeping quality for long distance market is much more than other varieties. 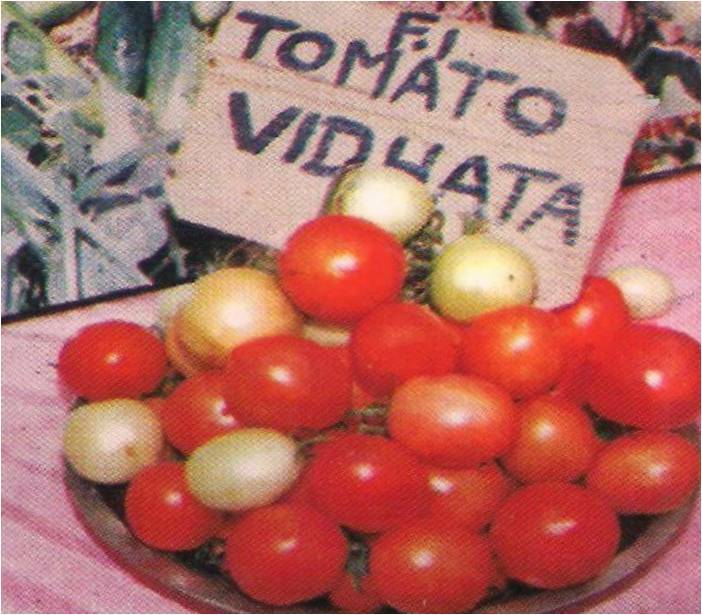 Vidhata is vigrous and determinate hybrid suitable for fresh market and processing. This variety yields upto 40 tonnes per acre and is highly recommended for long distance transportation. Plants show market resistance to Verticillium and Fusarium wilts. An early uniformly maturing variety (115days), produces most attractive medium sized (av.70-75 gm), jointless, round and firm fruits. Excellent material for higher temperatures. A large fruiting hybrid. Fruits larger than 100-110 gms. Excellent bearer in Autumn sawing in North India. Despite large size, the fruit do not crack. Excellent quality for salad. 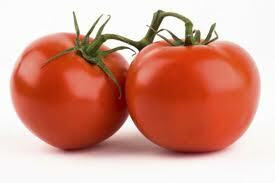 A new concept in fresh and processing types of tomatoes. This is an early & prolific bearer. 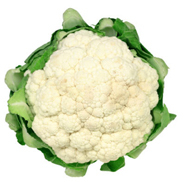 An excellent variety for fresh market, although could be used for processing also. Plant type is open. 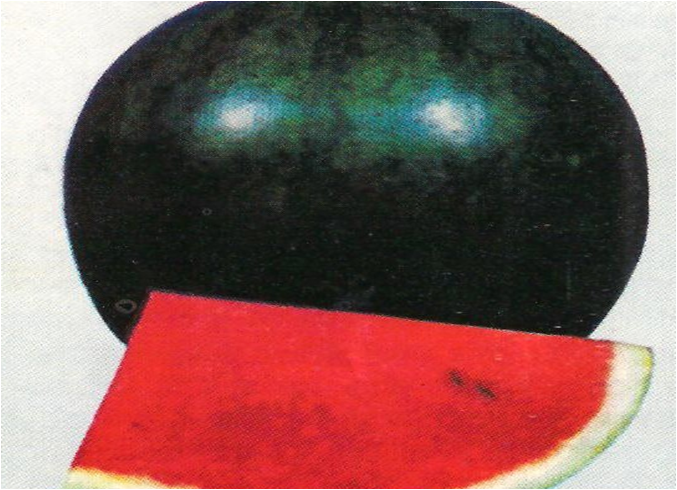 Fruits round., attractively colored and very firm, weight 70-80 gms. Early Apoorva is a high yielding early variety. Its pod size is 8-10 cms. Having 8 to 11 pieces in one pod. Pod color is dark green, bright & very sweet in taste. Fruiting maturity is about 40-45 days. Plant height is 85-90 cms only. 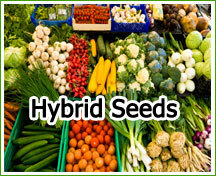 Seeds quantity are 35-40 Kg. & yeild are 80 to 85 quintal per acre and 180-210 quintals per Hectare. 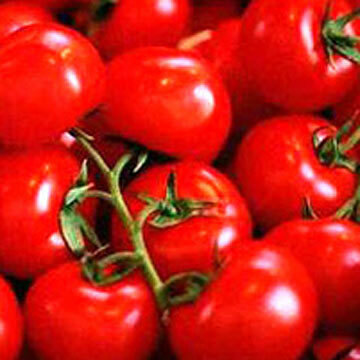 Its keeping quality for long distance market is much more than other varieties, it remains fresh for 4-6 days. 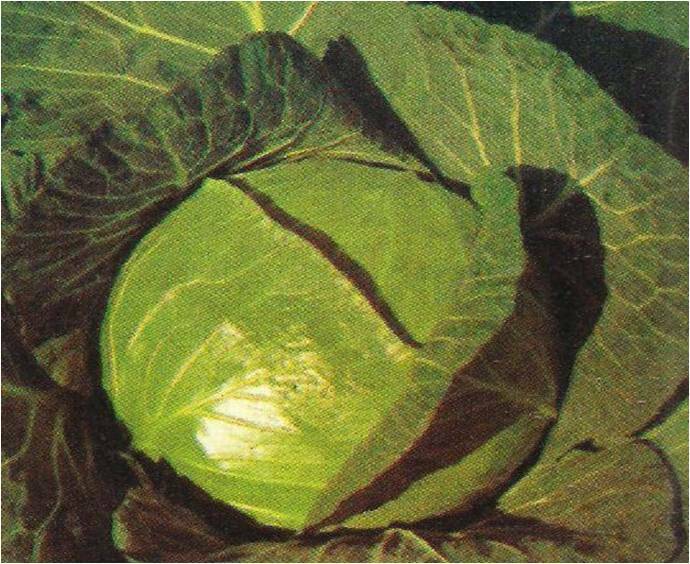 An excellent vareity of cabbage. Heads very solid and do not burst even after several days of maturity. Dark green color leaves have a protective layer making it suitable for rainy season. Maturity 55-65 days after plantation 1 to 1.5 Kg.weight. 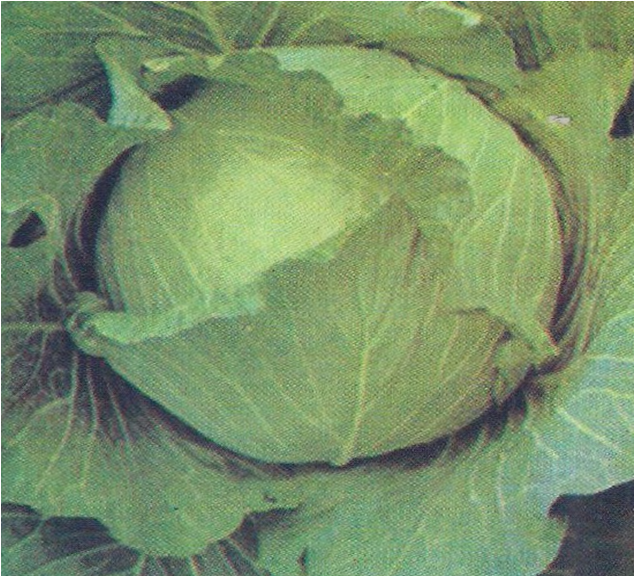 This is a medium type hybrid cabbage that can be harvested in 60-70 days after setting plants. It thrives well and forms good heads in tropical area, Plants are compact, Heads are slightly flat, firm, weight approx..1.25 kgs upto 2 kgs. Outer leaves are dark green. Good for shipping and storage. Avery popular hybrid in ball headed group. True to its name, it has shown remarkable qualities of uniformly and compactness weighting 1 to 1.25 kg. with small plant frame and short stem. A few outer leaves are well adapted for close planting. This variety has good texture as well as holding capacity. Excellent material for early fresh market as also for kitchen gardens. Extremely good material for North-East region. Has done extremely well in West Bengal, Assam and Orissa. 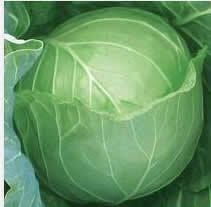 It is a mid-season flattish round headed hybrid with large plants and strongouter leaves. Solid heads of 2.5 to 3 kg. have good holding capacity. It is more adapted for sowing during rainy season in these regions. Heads are tasty and excellent for fresh market. A very popular medium - large size hybrid. Heads dark green color, stay in the filed for much longer period if, allowed to grow in field, heads can grow upto 5 Kgs. Normally, the farmers harvest the heads when they reach size 2.5 Kg to 3 Kgs. An extra-early type maturing in about 50-55 days after transplanting. Curds very compact, small-medium sized firm dome shaped and of smooth texture. A very versatile variety. Shows market tolerance to Black Rot and leafiness during hot months. Retain pure white colour even in hot sun. Suitable for early spring sowing in western and southern region and early summer sowing in north india. This is a very good hybrid. Flower have weight 1kg to 1.250kg curd very compact and colour white. This hybrid matures in 70 to 80 days. Dark green leaf with big size gives security to curd. This hybrid is very tolerant to autumn, rainy, summer and cold session. 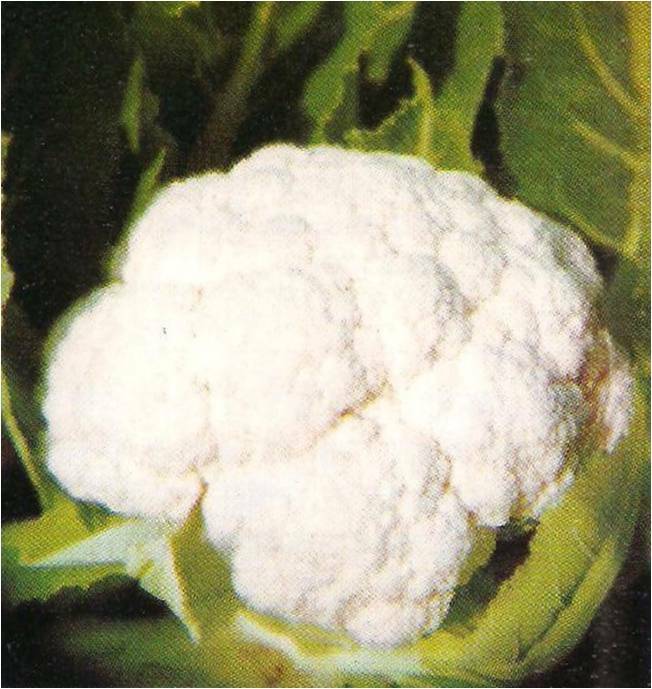 This Hybrid Cauliflower is Agehni variety. 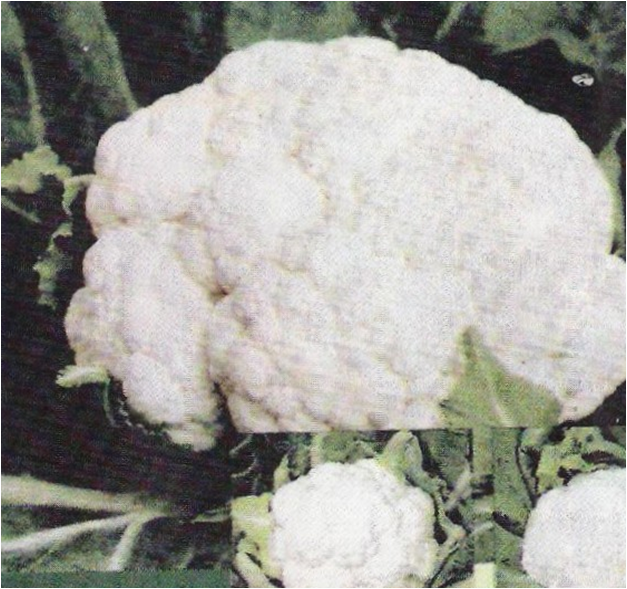 Flower white in colour and matures in 62-68 days. Weight approx 700gm to 900 hm approx. Flower comes in starting days of cold session. This variety have small stem. 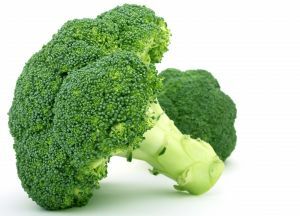 Broccoli fruits matures in 65 to 70 days. This Hybrid Broccoli is the best for every session. Fruits are dark green. This variety very tolerant to black rout. Plants upright and self-supporting with very high yield. A cluster bearing active purplish crisom in colour and green calyx with a few thickened spines. Average fruit weights 40-50 gm, should be harvested at tender stage. Average yield 45-48 tonnes per hectare. 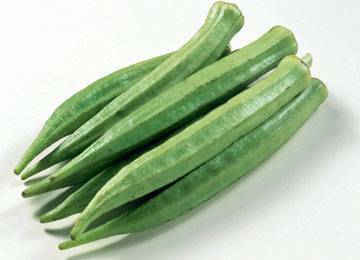 Having Green Calyx this variety is a selection of our most popular "Urvashi" variety. 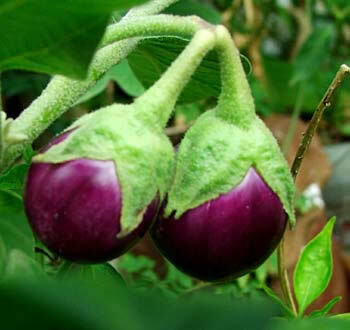 More suitable to monsoon and more flexibility for fruit size at harvest stage because the seeds are slow maturing. Very good in taste also. 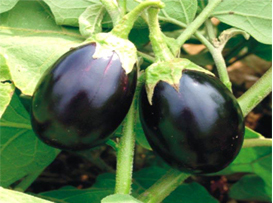 Glossy deep purple black with firm fruits ablongish shape with green calyx large size with 17-18 cm. polar diameter and 6-7cms. equitorial diameter, Fruits weight approx. 335-340 gm. on an average. Good texture and excellent flavoured pulp with few small seed. Early high yielding with upright plant. Harvest continuously for a longer period. 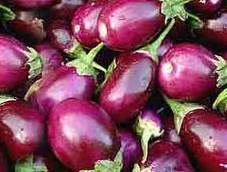 This is a new variety of round brinjal. Plants are tall, light green in colour with purplish tinged top leaves. Fruits are medium large in size (Polar diameter 5" x equatorial diameter 3")at edible stage, pinkish purple with green calyx and few spines. Fruits remain edible upto late stage. This variety has shown high yields compared to open pollinated varieties. Bound to get a very high market premium. 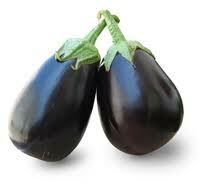 Fruits are attractive purplish black in colour & green calyx, round medium size, average 220-280 gm. weight fruit with excellent flavoured pulp and few small seeds. 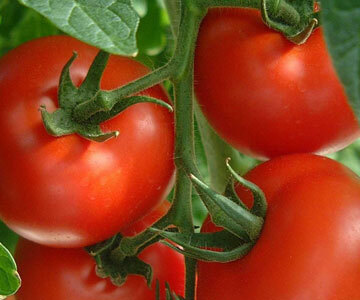 The plants normally produce abundance of fruits harvesting at early stage is recommended. This variety is a better selection of Hybrid Shanker. Average wt 320-330 gm. Round purplish black with green calyx with very few seeds. Very good in taste. 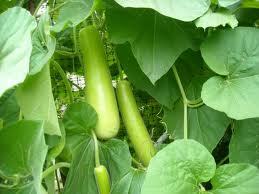 The plants of this variety are tall, vigrous, upright and bear fruits well off the ground. 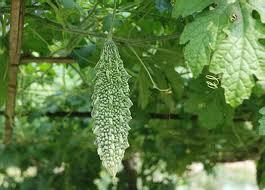 The uniform, long cylindrical shiny apply green fruits are borne early and in quick succession in bunches of 2-3. Fruits have excellent flavour and bear fewer slow maturing seeds. A good cropper. 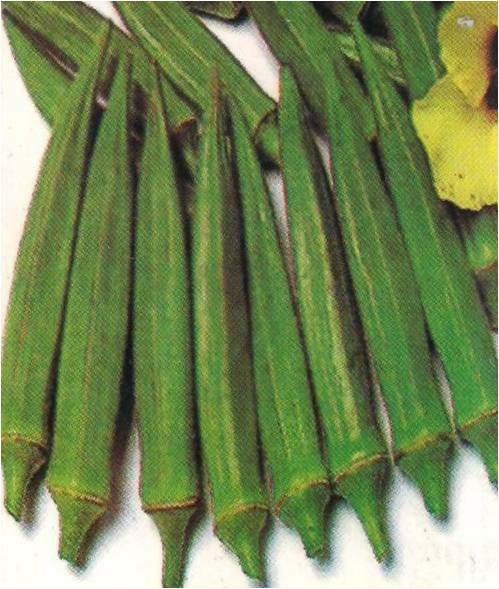 Kapila is an extra variety of compact plant habit having fleshy spines and short internodes. Small fruits (av. 50gm.) of most attractive purple colour contrasted by white stips and imposing apple-green succlent calyx with thickened thorns. Fruits have rich flavour. 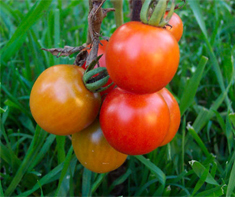 As plants naturally produce abudance of fruits, harvesting at younger stage (approx. at 6-7 cm. polar length) is recommended as this variety bears seeds early. A prolific cropper. 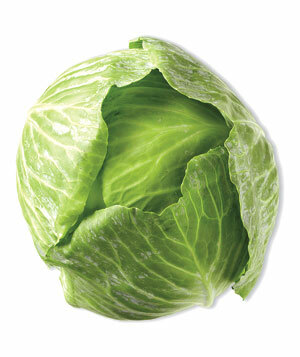 This hybrid combines high yield with earliness, uniformity and tenderness stumpy snaps fruits. 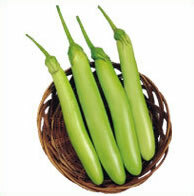 Ganesh commands highest market premium, because the fruits remain very tender for quite long time. Normally first female flower appears on 8th node. Fruits are ready for harvest in 60 days from sowing. Average fruit length 45-60 cm. with 7.5 to 9 cm. diameter and weights 1 to 1.5 kgs. at harvestable stage. This tall and vigrous hybrid bears a profusion (av. 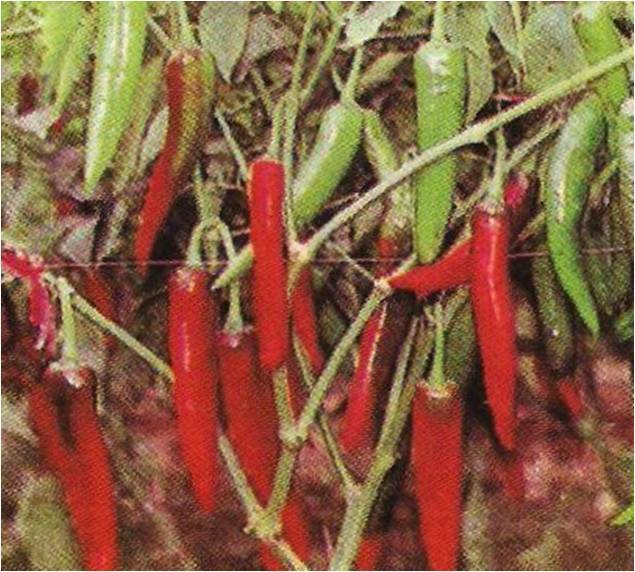 344) of pungent green fruits (deep-red on ripening) over a considerable long period. A good source of Vitamin C(138.19 mg) and capsacian (0.83%). Fruit medium size approx 7-7.5 cms and weight approx 8-8.25 gms. Shows moderate resistance to mosaic, leaf curl virus and wet-rot, resistant to die-back disease. Hybrid 201 is our front-line hybrid where no compromise has been made on fruit quality and to bring in low incidence of yellow Vein Mosaic (YVM). Low crude fibre and high total sugars, iron and phosphorus content makes this variety an excellent choice for nutrition conscious. A good yielder. 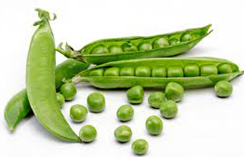 The pods are tender, glossy, deep green, silky and five angled. This early hybrid variety is very good resistant to Yellow Vein Mosaic. Fruit first picking starts about 45 days. Glossy pods green and five angled. very good for good market premium and better harvest. Fruiting begins from 5th node. Suitable for punjab, Haryana, Rajasthan, Western Uttar Pradesh and Madhya Pradesh. Days to first harvest 77 days and 50% harvesting can be completed upto 95 days from sowing. Early harvesting by 15-20 days is possible by raising the seedlings in polythene bags and then transplanting to the field. Vines long (2-2.4 meters), vigorous luxuriant growth. Sowing time is middle of february. Fruits are light yellow with light green sutures, rind is netted. Flesh is orange in colour, juicy sweet and flavoursome. Fruits beign netted can be stored for 2 days after harvesting at full slip stage under room temperature conditions. 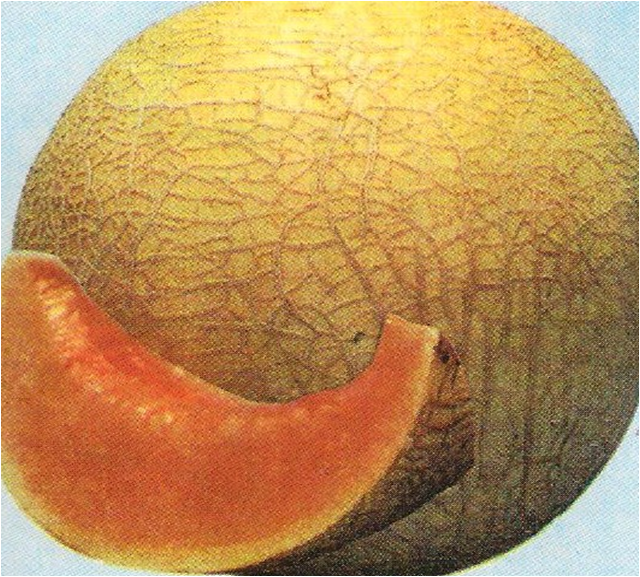 Fruits are light yellow with light green sutures, rind is netted. Suitable for distant transportation. Moderately resistant to powdery mildew. Blackish green, round variety fruit. Fruiting starts after 90-95 days. Very sweet taste. Fruit weight 5-7 Kg. The fruit pulp has very good flavor with small seeds lacking bitterness. Fruits are cylindrical attractive glossy algae-green colour having approx. 3cm. diameter and over 32 cm. length. The vines remain vigrous and bear over a considerably longer period. 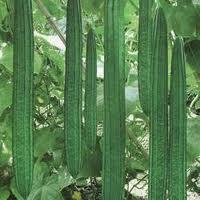 The fruits of this variety are deeply ridged, slender, straight with dark green colour, at an average length of 40cm. Fruit flesh is sweet & devoid of bitterness. Vines keep food vigour in higher temperature. Fruit of this variety are borne over a considerable long period. This variety is very famous in farmers as like as Taiwan variety. Fruits have excellent flavoured pulp's colour is red and wear a thick cover. Fruits are round and oblong. Fruits have weight 1 kg to 1.75 kg. This variety on approx yield is good average gives more than 800 to 850 qntl. per acre under very good climatic conditions. 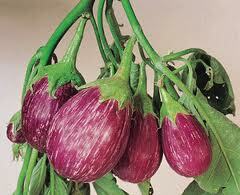 It is one of the earliest varieties grown over a wide are in the hills and plains of North India. It is recommended for all parts of the country. 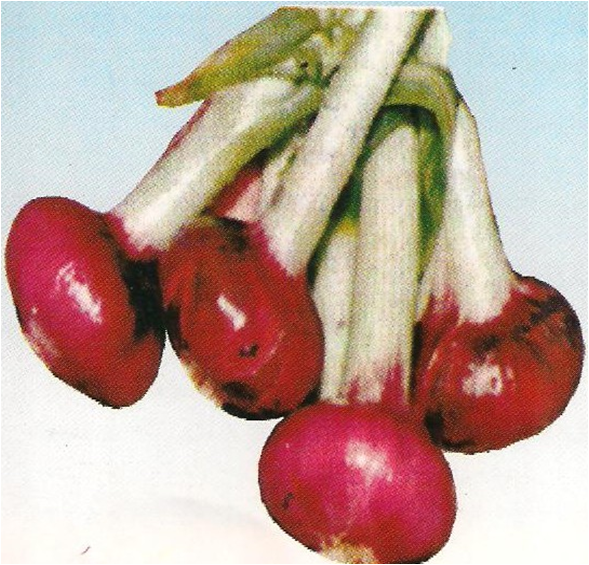 The bulbs of this variety are copper red coloured, round sweet and moderately pungent. It has less bolting and good keeping quality. Bulbs mature in about 160 days after sowing. Yield 300 to 350 quintals per hectare. 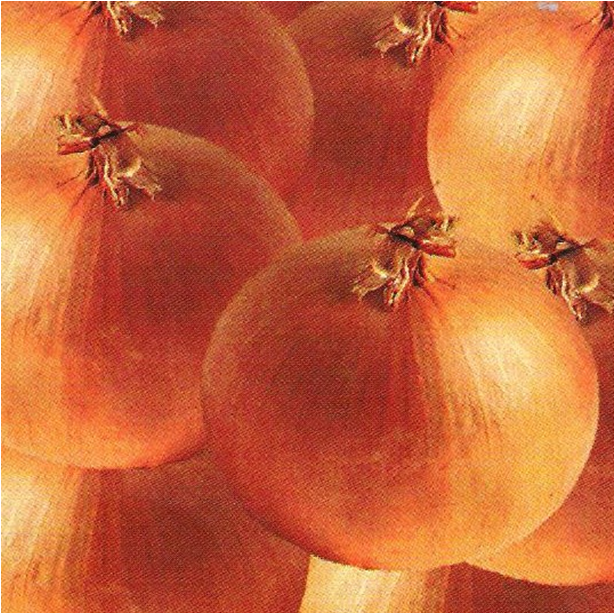 This is an excellent onion variety recommended for areas where Dark Pinkish colour bulbs are accepted. 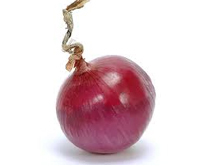 Bulbs are globular in shape and are 5cm to 7 cm in size with tight skin moderately pungent. Matures in 100-110 days after transplanting. Keeping quality is very good. Yield 300-350 quintals per hectare. Mainly recommended for sowing between September to November all over the country. LATEST DEVELOPMENT ONION HYBRID ALSO AVAILABLE WITH EXCELLENT RESULTS. An excellent variety in production. 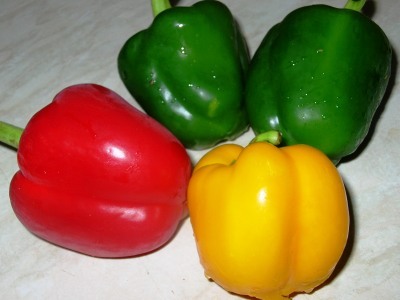 A compact sturdy growing sweet pepper or capsicum of about 140 to 160 gms. size. The fruits have a length of 10-11 cm. with a diameter of approx 8cm. The sowing time for Northern India in April to May and August to December. Light loam soil is the best for this crop. 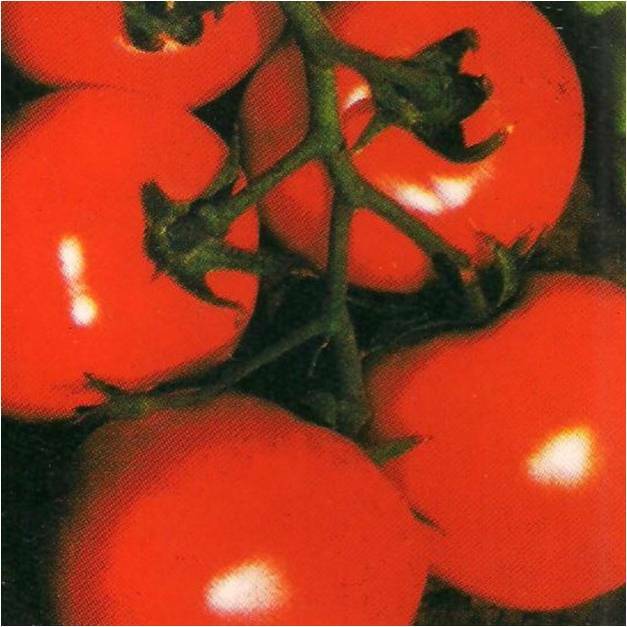 This variety is resistant to Tomato Mosaic Virus. The fruits have a strength length about 20cm with a diameter of approx 18 cm. 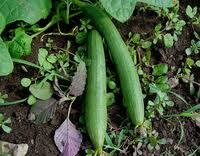 Fruits thickness about 3.5 cm to 4 cm with Dark green colour. This was First crop of "Heritage Green" ready in 70-72 days. 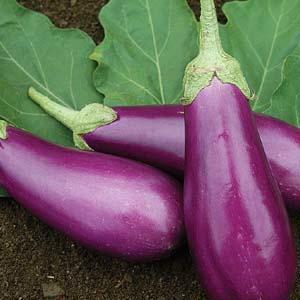 This variety is very good for good market premium and better harvest.